Usually, store owners are interested what are the advantages and disadvantages of particular platforms. We decided to introduce you the two shop systems that appear to be very popular in the implementation of eCommerce projects. 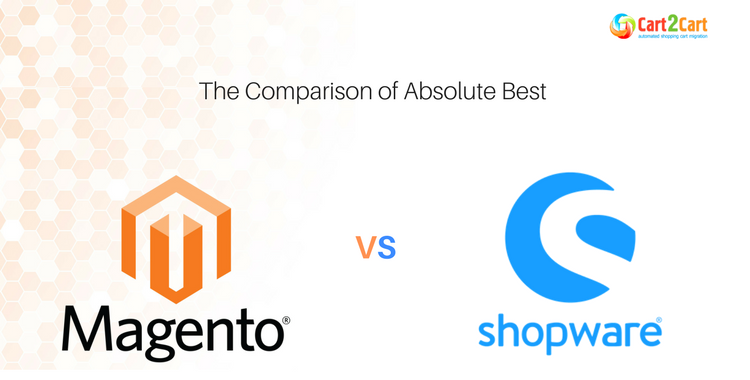 This overview of differences and similarities and detailed Shopware vs Magento comparison will make choosing the one you need easy as piece of cake. Let the show begin! 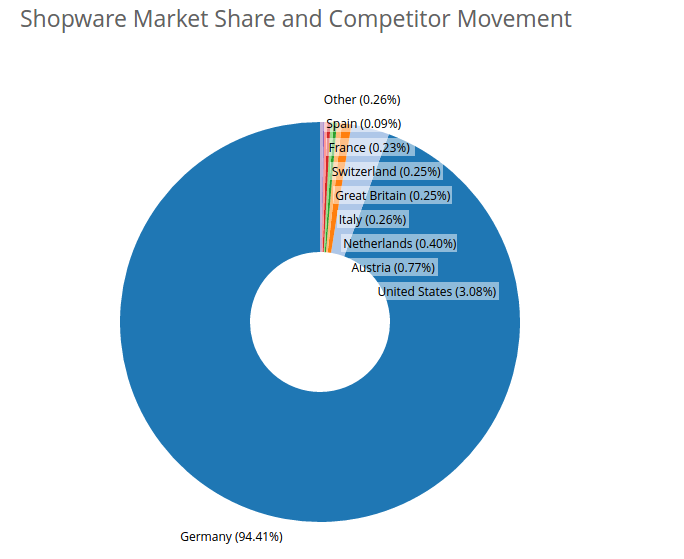 Shopware is the most popular and progressive platform among German-speaking part of the community- what could is clearly seen on the chart below from builtwith.com. Shopware Is successfully concurring the eCommerce market during 17 years. Shopware if fully open-sourced from scratch and allows you to modify or extend your store according to your needs. Due to builtwith.com research, Shopware is actively gaining customers from Magento and other robust solutions with code access since 2011. The data is just from 2011 because i suppose that's the time builtwith site was built. Magento is currently the most flexible and leading open-source solution with impressive list of extensive features one can never find in eCommerce software. Magento is named to be the “Industry standard” among the robust platforms offered by today’s e-market. It offers literally unlimited possibilities to tech-savvy merchants. According to builtwith.com statistics Magento is extremely popular all over the world, the largest percent of users is concentrated in US. Shopware is approachable not only to customers but to store owners. It relieves you of many headaches and expenditure on developers in the initial setup. It has the intuitive administrative interface and provides you with backed that is compatible with any operating on-the-go system and browser. 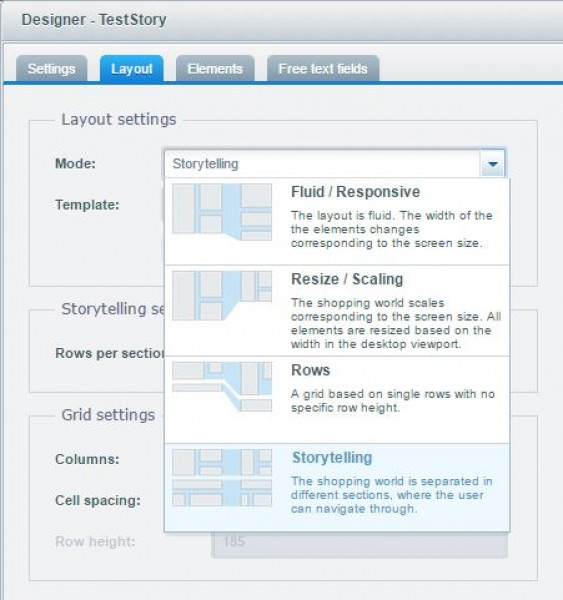 Shopware offers drag-and-drop and double-click features. They facilitate your store management and spend less time in the backend. Thanks to parallel opening of multiple windows, you can always have the clear overview of all data you need. Magento is a bit more complicated. For long time administration of Magento store looked tricky and challenging, especially for non-tech store owners. But now, the second generation of most flexible platform, the long-awaited Magento 2 has changed things significantly. Magento 2.x provides merchants with intuitive and user-friendly Admin Panel. It offers improved management interfaces that streamlines the search of data in Admin Panel and enables to create new content easily. 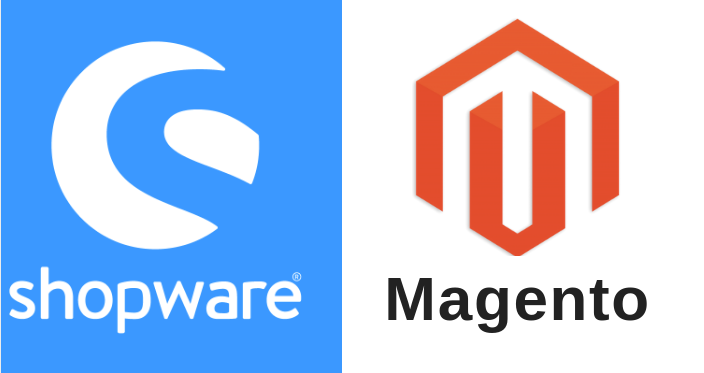 Summing up the comparison of Magento and Shopware in user-friendliness, it’s worth to say that both platforms are fairly simple in daily operations. Magento is more complicated in actual setup and customization process. If you’re not familiar with web development that can challenge you a lot. And if you want to feel all the advantages of Magento’s advanced features, you need to spend some time scrolling though its documentation. Magento demands extensive coding to manage page-layouts.That’s why, one more point goes to Shopware for allowing modifications without it. If you are tired of spending money of someone taking care of tech side your store, you can easily switch from Magento to Shopware and there will be nothing to worry about in implementation of advanced store. The merchants who go in feet with time can’t deny the importance of visibility in Google search and effective marketing strategy to raise brand awareness in modern eCommerce industry. In the Shopware vs Magento comparison of SEO-friendliness, we should mention that Magento is the most SEO-optimized platform accoring to ecommerce-platforms.com research. It scores 100 point out of 100. Amazing result! Magento offers many SEO setting out-of-the-box. They include product and pages metadata, image optimization, canonical tags for products and categories, edit of robot.txt files, etc. Magento SEO friendly URLs guarantee the increase of SERP. With release of Magento 2.x and new SEO-optimized features, now it’s even easier to be loved by Google and increase chance of successful purchase. Effective marketing tools allow setting app promotions. Private sales and segment customers by various factors, etc. Meanwhile, when you need to put some efforts to use all advanced Magento SEO tools, SEO-optimization in Shopware is automatically configured. From the outset it has one goal - Sell. Its integrated SEO-friendliness provides a solid basis for a successful Google ranking. Shopware also focuses on online marketing and offers many powerful features for sales promotion. One of such features is “Storytelling” - it gives your shop a chance to become authentic and unique. This emotional catalyst inspires shopping experience. After clicking or touching on image the customer gets further details of items connected to image. This engaging approach creates an enjoyable buying experience and contributes to exceptional usability. Storytelling increases customer engagement on personal level and develops individual ties with your brand. It transfers the emotional impact to a possible purchase. This feature takes your product review to a next level - items become tailored to coordinate with the context of customer moods and values. It helps to learn more deeply your target group needs and wishes. Storytelling feature allows you to create so-called “shopping world” of your product - the scenario how it’s gonna appear to a customer. To build shopping worlds, you can use various elements focused on images: banners, SideView, videos. After carefully planning your scenario, you can use the power of images to attract customers in short time. Storytelling will make your store not only focused on selling product, but providing value to your visitor. In the Shopware vs Magento review we want to show you what businesses are mostly using these robust platforms. 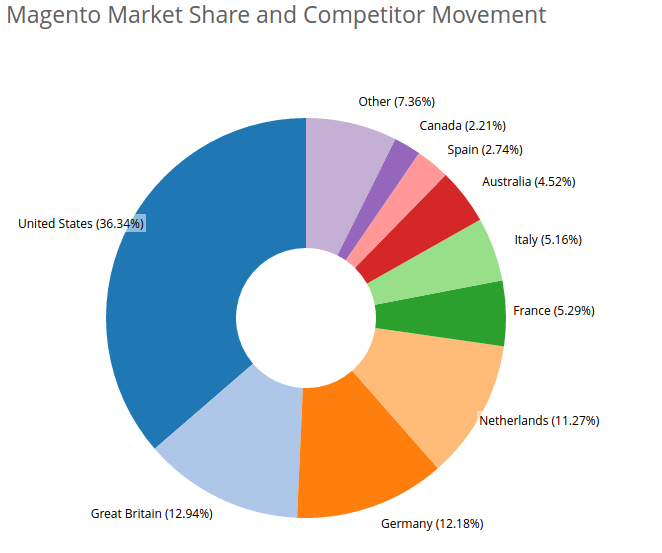 According to similartech.com Magento is more popular in such areas: Shopping, Business & Industry, Arts and Entertainment, etc. 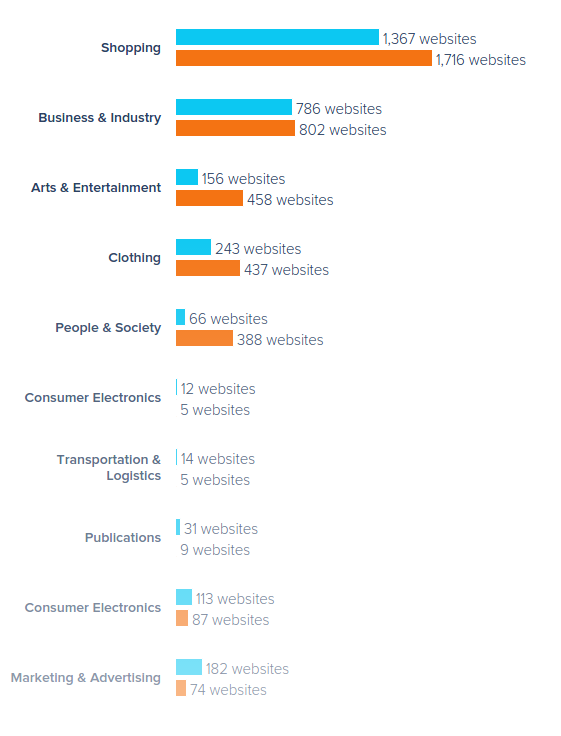 Shopware in its turn is leading in Marketing & Advertising, Publications, Consumer Electronics, etc. The most known Magento consumers are: Christian Louboutin, Nike, Coca Cola, Burger King. Shopware is serves as a platform to: Philips, Lufthansa, Mercedes-Benz, L’Oreal. No matter which platform you choose Magento or Shopware, they both are robust and scalable enough to build a professionally-looking advanced store. What might be interesting to you is that these eCommerce solution have sort of different approach. Shopware is B2C oriented, while Magento uses both business models, but performs exclusively well in B2B. Shopware is fully concentrated on storytelling and positive customer experience. It makes Shopware oriented mainly of B2C market. This shopping cart is extremely suitable to Fashion, Art of Lifestyle industries (small or medium-sized). Shopware is less suitable to B2B approach due to peculiarities of its functionality. B2C( business-to-consumer) differs a lot from B2B (business-to-business) business model, as it sells products directly to customers, but nevertheless, business buyers are consumers too. Magento is mostly perceived as B2B-oriented platform with wide range of areas included. It is a leader in B2B commerce, serving to 41 merchants on the Internet Retailer B2B eCommerce Top 300 list. Magento makes managing inventory easier for business clients, giving an ability to create scheduled deliveries and track inventory across multiple warehouse locations. It also offers negotiated pricing terms for business buyers. Sounds good, isn’t it? Though, this “Industry standard” is never behind and fits well both B2B and B2C models, adapting quickly to all eCommerce needs. Magento fits perfectly to large enterprises or medium businesses. Regarding technology, Magento 2 is the winner and stays on the top of eCommerce platforms list. Magento 2 supports Nginx by default, it works with Apache, PHP, MySQL and many others. But we are convinced that Shopware has also something to boast of. Shopware is full of top-notch technology, that allows to stay competitive in modern eCommerce world. These technology includes PHP7 that facilitates the coding routines. The same has Magento 2x. What is important, Shopware has the open-source API unlike Magento. This unique feature allows to connect to any third-party solution and make individual customizations. Isn’t it awesome? Both Shopware and Magento use MySQL database for storing. It insures smooth store running and saves time and money. Magento 2.1 is proud of new stunning feature - Elasticsearch (one of best search engines designed to handle large catalogs). What is the intrigue? From now, the new Shopware 5 is supplemented by the same powerful tool. Looks like Shopware is growing dynamically. It’s not a secret that one of Magento strengths is its community - something other platforms can only dream about. It counts one of the biggest concentration of developers in the world - more than 150 000 active members. This makes finding answers extremely easy, e.g. there is always somebody who has built or improved particular plugin. In addition, there is a lot of helpful documentation, user guides, blog posts, etc. The EE clients have also access to 24/7 phone and ticket support. Shopware has offers its own forum and WIKI to users. It works good for German-speaking community because it is available in German only. So, if you don’t have a wish to learn a new language that could confuse you a bit. Shopware offers support service, but the same as in Magento it is not available in Community version. Developers from all over the world contribute to the Shopware and Magento source code. Thanks to it, these platforms meet the highest industry standards. Interesting fact: According to statistics, average Software developer rates hourly two times less than Magento, so consider the fact that Shopware is easier to setup and develop by yourself. What’s the outcome of Shopware vs Magento review? Whatever Shopware or Magento you’ll choose to run your business - you will be not mistaken, for sure. Both platforms can be proud of modern software architecture and powerful feature list. Deciding to build your store on one of these platforms you can be sure - your investment is secure. As mentioned in the beginning, Shopware is constantly gaining customers from Magento. This happen because the store owners of small businesses find Shopware easier and cheaper to run. But Magento complexity was never for everyone - it’s for those who understand how much possibilities they are offered. The main benefit of Shopware here is that using it, you're able to setup a professional store with less efforts. Shopware looks attractive to those merchants who need effective marketing tools to run considerably large businesses, as these features are not enough for enterprise sizes. Nevertheless, the choice is yours! If you currently running on other platform than Shopware or Magento, believe me, you’re missing a lot. If after reading this article, you accidently noticed that your current solution doesn’t meet your BIG GOALS, no worries - we know what to do. Find your platform in the largest list of 80 supported shopping carts and perform a secure and fast data migration to Shopware. Or transfer your store to Magento in few mouse clicks. Cart2Cart migration service enables you to perform effortless 3-step data transfer and get your new store in couple of hours. Note that no technical skills are needed, because your data will be imported to desirable store automatically. In case you have any migration-related questions, feel free to contact our 24/7 support staff. Ready to enrich your business with top-notch functionality? Start FREE DEMO migration right now.